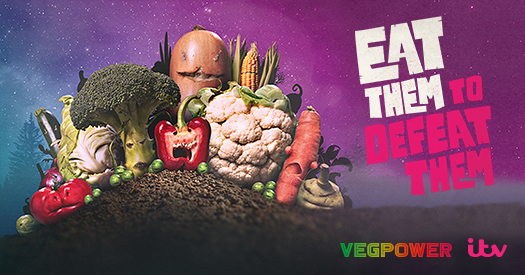 New campaign #EatThemToDefeatThem aims to inspire kids to eat more healthily, looking to reinvigorate how vegetables are viewed and consumed. The advert, which has launched across some of ITV’s biggest programmes, is a collaboration between VegPower and ITV - the largest commercial television network in the UK. An alliance of supermarkets and brands have donated to the Eat Them To Defeat Them initiative and helped fund the campaign, including Aldi, Asda, Co-op, and Marks & Spencer. There are also advert posters, stickers, and wall charts where children take on the role of a hero who, with the help of their parents, will try and save the world from being overrun by angry vegetables. In order to win, they have to Eat Them To Defeat Them. According to Veg Facts - The Food Foundation, 96 percent of teenagers and 80 percent of primary school age children don’t eat enough vegetables. Whole YouGov reports that nearly half of parents wait at least five minutes or more at family mealtime for their children to finish their vegetables, which equates to 30 hours a year.